Walking through the streets of Istanbul one day, I smelled chickens roasting. Now that’s a wonderful fragrance anywhere in the world, but at this particular place the chickens were on a spit in an outdoor oven and underneath them was a pile of potatoes still in their skins. As the potatoes cooked, they soaked up seasoned juices from the chickens above and became enriched with flavor. My immediate thought was, “I’ve got to try that when I get home.” When I started experimenting with the method, I thought I’d get the best results by roasting sliced potatoes underneath chicken quarters on the same baking sheet. But it didn’t work out that way. The potatoes didn’t get as crisp as I wanted. So I modified the concept, arriving at a simple side-by-side cooking technique that delivers amazing results. 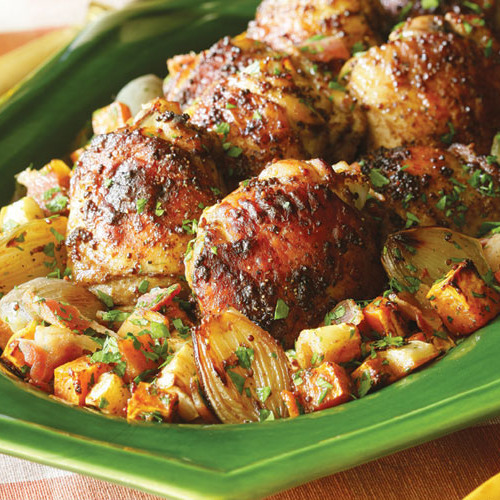 I choose chicken thighs for their juicy flavor and roast them alongside potato chunks or wedges on a baking sheet. Both are better for the combination, and it’s efficient, too. As soon as you pull the pan out of the oven, supper is two-thirds done. All you need to round out the meal is a green salad or vegetable sauté. Before cooking, I season the chicken and potatoes boldly. I might let the chicken bathe in a zesty marinade for a few hours. Or, I’ll toss the chicken and potatoes with a mixture of dry seasonings such as salt, spices, and citrus zest. Or, I’ll make some flavored butter and smear it under the chicken skin. 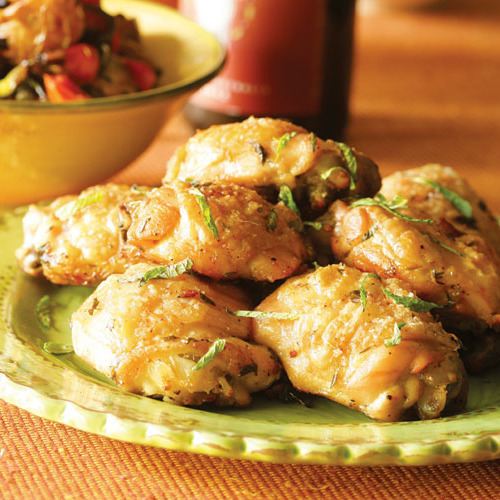 The well-seasoned chicken releases delicious juices that mingle with the potatoes on the baking sheet. 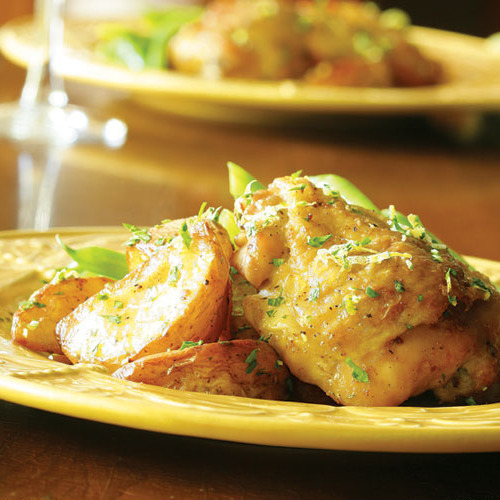 After cooking, as a finishing touch, I top the potatoes and chicken with a sprinkling of fresh, bright flavor such as citrus, ginger, or herbs, right before serving. Once you become familiar with this seasoning technique, feel free to start improvising your own flavor combinations or try our suggested recipes. 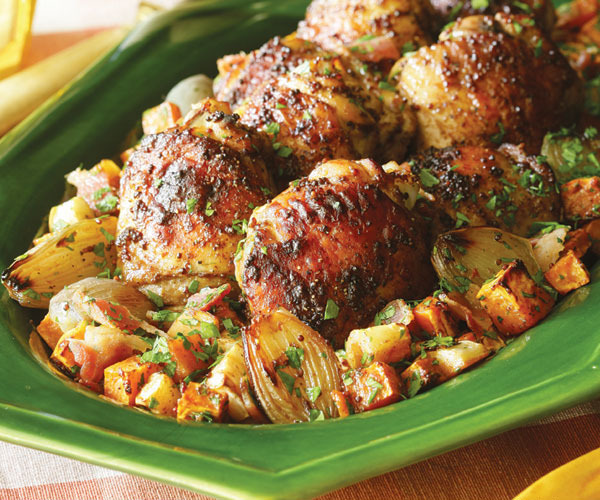 Roasted Chicken Thighs, Yukon Gold Potatoes & Lemons with Cilantro Gremolata, Roasted Chicken Thighs, Baby Potatoes & Tomatoes with Olives & Mint, Chicken Thighs Roasted with Rosemary, Red Onions & Red Potatoes, Burnished Chicken Thighs with Roasted Sweet Potatoes, Parsnips & Shallots. Use dark meat. It’s richer than white meat, so it stays moist and juicy even if you cook it a little longer than might be ideal. Don’t crowd the pan. 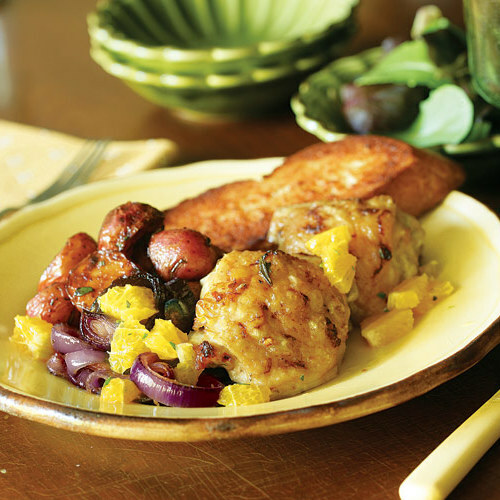 An 11×17-inch heavy-duty rimmed baking sheet is the perfect size for these recipes. If you don’t have a large one, use two smaller baking sheets. To order one, visit Bakerscatalogue.com, where the pans sell for $17.95. Baste the chicken and stir the potatoes often. For the best browning and crisping, bake them on opposite sides of the baking sheet, and baste and stir from time to time to incorporate the flavorful browned bits from the baking sheet.